Barbaric honour crimes that have come to stay in the northern states of Punjab, Haryana and Uttar Pradesh appear more rooted in girls’ empowerment than in same gotra marriages that Khap panchayats are happily advocating. Preliminary findings from a study commissioned by the National Commission for Women (NCW) reveal that 72 per cent of the 326 documented honour-related crimes in the aforementioned vulnerable states over the past one year involve couples that entered into inter-caste marriages. Only three per cent of these cases — data collected from authentic sources like the police and court records — involve youngsters in same gotra marriages where the issue of Jat pride and Khap panchayats actually comes into play. As many as 15 per cent crimes happened in situations where couples married without the consent of families. Seven per cent happened where youngsters entered into contentious wedlocks having run away from their houses while one per cent involved couples in inter-religious weddings. The findings point to a new reality — honour crimes are happening primarily in situations where girls are walking out on families to exercise their own choice of marrying a boy from another caste or someone their parents didn’t consent to. Plainly put, girls are paying a price for making personal and professional choices.“This assumption is not an exaggeration. During our research, we went through all the cases minutely and found that the trend is more about a patriarchal society’s intolerance for girls’ empowerment than anything else. In Haryana alone, more boys than girls are now dropping out of school; more girls than boys are landing themselves good jobs. This is not going down well with the system. That’s why girls’ families are the largest perpetrators,” Ravi Kant, president, Shakti Vahini today told TNS. He is also the petitioner in the honour killing PIL filed in the Supreme Court, which has issued notices to eight state governments. The researchers are also attributing the crimes to fears of property division among families. “When girls marry against parents’ choices, there is always a possibility that she might claim her property share as per the Hindu Succession Act of 2005. In arranged marriages, that’s less likely. This fear is another cause behind honour crimes. As for Khaps, they are just drawing political mileage out of the situation,” Kant said. The most startling finding of the report, which seeks a legislation to deal with honour crimes, relates to the perpetrators of these killings. Submitted to NCW on Monday, the preliminary report prepared by Shakti Vahini, a civil society organisation, concludes that girls’ families was the perpetrator in 84 per cent cases of honour-related killings and injuries in Punjab, Haryana and Western UP. In 14 per cent cases, the boys’ families were the accused, while in the rest two per cent, both sides were equally responsible. 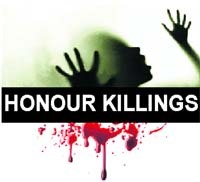 State women commission chairpersons of Punjab and Uttar Pradesh, two of the most affected states by honour killings, were not represented at a meeting of member secretaries and commission chiefs organised by NCW on Monday to discuss key issues, including a law on honour killings. Representatives of Madhya Pradesh, Rajasthan and Karnataka were also absent. NCW chairperson Girija Vyas has, meanwhile, sent her suggestions to the Home Ministry, which is framing the law to deter honour killings.